The District Municipality of Muskoka is a Regional Municipality located in Central Ontario, Canada. Muskoka extends from Georgian Bay in the West, to the Northern tip of Lake Couchiching in the South, to the Western border of Algonquin Provincial Park in the East. Located approximately a two-hour car drive north of Toronto, Muskoka spans 6,475 km2 (2,500 sq mi). Muskoka has some 1,600 lakes, making it a popular cottaging destination. 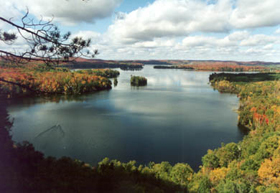 This region, along with Haliburton, Kawartha Lakes, and Peterborough County is referred to as "cottage country", and sees over 2.1 million visitors annually. Muskoka is a scenic area sprinkled with picturesque villages and towns, farming communities, and lakeside vacation hotels and resorts near to golf courses, country clubs, and marinas. The regional government seat is in Bracebridge and the largest population centre is Huntsville. Peninsula Lake, near Huntsville in Muskoka has 60,000 permanent residents, but an additional 100,000 seasonal property owners spend their summers in the region every year, making this a major summer colony. Many of the seasonal properties are large mansion-like summer estates, some of which have been passed down through families from generation to generation. Most of these expensive properties can be found along the shores of Muskoka's three major lakes: Lake Muskoka, Lake Rosseau, and Lake Joseph. In recent years, various Hollywood and sports stars have built retreats in Muskoka, including Steven Spielberg, Tom Hanks, Mike Weir, Martin Short, Harry Hamlin, Cindy Crawford, Goldie Hawn and Kurt Russell. The Muskoka region was ranked #1 for best trips of 2011 by National Geographic. Also was among the best trips of 2012 by National Geographic. Many summer camps are located in the region, to take advantage of the lakes, which offer opportunities for canoeing, sailing, windsurfing, kayaking, waterskiing, and other water activities. The area provides a refuge from hot cities during the summer months. 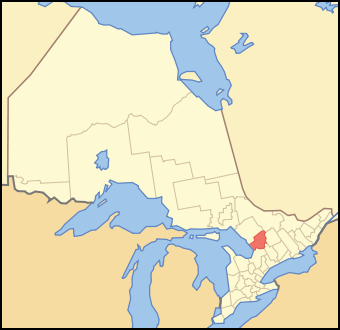 There are six municipalities in Muskoka: the towns of Bracebridge, Gravenhurst, and Huntsville; and the townships of Georgian Bay, Lake of Bays, and Muskoka Lakes. The Wahta Mohawk Territory and Moose Point 79 are also in the district. The population of Muskoka as of 2011 is 58,047. Geography drove history in the Muskoka region. Outlined with lakes and rocks, the good land offered an abundance of fishing, hunting, and trapping, but was poorly suited to farming. Largely the land of the Ojibwa people, European inhabitants ignored it while settling what they thought were the more promising area south of the Severn River. The Ojibwa leader associated with the area was Mesqua Ukie, for whom the land is believed named, as he was liked by the European Canadians. The tribe lived south of the region, near present-day Orillia. They used Muskoka as their hunting grounds. Another Ojibwa tribe lived in the area of Port Carling, then called Obajewanung. The tribe moved to Parry Sound around 1866. Since the late nineteenth century, Doncaster Reserve 14 is an area used for hunting and fishing by Mohawk from both the independent Kanesatake and Kahnewake reserves. An area was bought by the Sulpician Order brothers based in Oka, Quebec, to relocate Mohawk from that area because of a continuing dispute over land rights. In the early 21st century, this reserve has fewer than 10 residents. Until the late 1760s, the European presence in the region was largely limited to seasonal fur trappers, but no significant trading settlements were established. The Canadian government interest increased following the American Revolution when the government began exploring the region. It hoped to develop a settled population there and wanted to find travel between Lake Ontario and Georgian Bay. In 1826, Lieutenant Henry Briscoe became the first European man known to have crossed the middle of Muskoka. The explorer David Thompson drew the first maps of the area in 1837 and camped near present-day Beaumaris. Canada experienced heavy immigration from Europe in the mid-19th century, especially from Ireland, which experienced famine in the 1840s, and Germany, with refugees fleeing the social unrest of the German Revolutions. As the land south of the Severn was settled, the government planned to open the Muskoka region further North to settlement. Logging licenses were issued in 1866 which opened Monck Township to logging. The lumber industry expanded rapidly. They developed road and water transportation which contributed to later town settlement. The railroad pushed North to support the industry, reaching Gravenhurst in 1875 and Bracebridge in 1885. Road transportation took the form of the Muskoka Colonization Road, begun in 1858 and reaching Bracebridge in 1861. Logs were placed perpendicular to the route of travel to keep carriages from sinking in the mud and swamps. This made for extremely rugged travel. The lumbering industry spawned a number of developments, with settlements springing up to supply the workers. Bracebridge (formerly North Falls) saw some leather-tanning businesses develop. Tanners used the bark from lumber to tan hides, turning what would otherwise be a waste product to effective use. The passages of the Free Grants and Homestead Act of 1868 opened the era of widespread settlement to Muskoka. Settlers could receive free land if they agreed to clear the land, and have at least 15 acres under cultivation. Settlers under the Homestead Act, however, found the going hard. Clearing 15 acres of dense forest is a huge task. Once the land was clear, the settlers had to attack Muskoka's ubiquitous rocks, which also had to be cleared. Consisting largely of a dense clay, the soil in the region turned out to be poorly suited to farming. As news of the difficult conditions spread back to the south, development in Muskoka began to falter, but development of the steamship revived industry. In a time when the railroads had not yet arrived and road travel was notoriously unreliable and uncomfortable, the transportation king was the steamship. Once a land connection was made to the Southern part of the lake in Gravenhurst, the logging companies could harvest trees along the entire lakefront with relative ease. Steamships gave them the way to ship the harvest back to the sawmills in Gravenhurst. Sometimes called the Father of Muskoka, Alexander Cockburn began placing steamers on the lake. Starting with his steamship the Wenonah, Ojibwa for "first daughter". In 1866 Cockburn pressed the government to open the entire Muskoka lake system to navigation. He urged installing locks in Port Carling and opening a cut between Lake Rosseau and Lake Joseph at Port Sanfield. The government was eager to reinforce development in light of the faltering agricultural plan, and built the big locks in Port Carling in 1871. Cockburn's steamers had access to the entire lake system. Through the years he added more ships; when he died in 1905, his Muskoka Navigation Company was the largest of its kind in Canada. John Campbell and James Bain Jr in 1860 made a journey that marked them as perhaps the first tourists in the region. Taking the Northern Railway to Lake Simcoe, they took the steamer up the lake to Orillia, and rowed across Lake Couchiching. They walked up the Colonization Road to Gravenhurst, where they vacationed. They liked what they saw and repeated the journey every year, bringing friends and relatives. These early tourist pioneers increased demand for transport services in the region. People were drawn by excellent fishing, natural beauty, and an air completely free of ragweed, providing relief for hay fever sufferers. Early tourists built camps, but were joined by others desiring better accommodations. Farmers who were barely scratching a living from the rocky soil soon found demand for overnight accommodations literally arriving on their doorsteps. Some made the switch quickly and converted to boarding houses and hotels. The first wilderness hotel, called Rosseau House, was built at the head of Lake Rosseau in 1870. It was owned by New Yorker W. H. Pratt. The idea of tourism caught on and the number of tourists increased, establishing the tourist industry as the up-and-coming money earner in the 1880s. The steamship era gave rise to the area's great hotels: Rosseau, Royal Muskoka, Windermere, and Beaumaris. When the railroad reached Gravenhurst in 1875, the area grew rapidly. Travel from Toronto, Pittsburgh, and New York became less a matter of endurance than expenditure. Trains regularly made the run from Toronto to Gravenhurst, where travelers and their luggage were transferred to the great steamers of the Muskoka Navigation Co, such as the Sagamo. Making regular stops up the lakes, including at Bracebridge, Beaumaris, and Port Carling, tourists could transfer to smaller ships, such as the Islander. Improving transportation links opened smaller or more remote upper Muskoka lakes to tourism around the turn of the 20th century, with steamers out of Huntsville servicing hotels like Deerhurst on Peninsula Lake. The Portage Railway between Peninsula Lake and Lake of Bays enabled easy access, resulting in a blossoming of tourism there, with 21 hotels eventually springing up, among them notably the Wawa and Britannia hotels and perhaps culminating in the Bigwin Inn. The hotels became the centres of wealthy vacationers' lives, and families conducted extended stays that could stretch for weeks or months in the summer. As families became seasonally established, they began building cottages near the hotels; at first simple affairs replicating the rustic environment of the early camps. Initially cottagers relied on rowboats and canoes for daily transport and would sometimes row substantial distances. In the era of the steam and gasoline launch, tourists relied less on muscle power and more on motors. With the boats, the wealthier summer people built boathouses, often elaborate structures in their own right, in many cases designed with the look and feel of the main "cottage". World War I caused a large dip in the tourist activity for the area and economy. After the war advances in the automobile brought demand for improved roads. These two developments, motorboats and private cars, created greater overall development of the area; they also encouraged the spread of development around the lakes, as people no longer needed to be near major landings. Freed from the ports of call of the steamships, people built cottages farther away. Demand began dropping for passenger space on the steamship lines. Demand increased for air transportation. The earliest runways of Muskoka Airport were laid out in 1933. The airport has been upgraded, and was used during World War II as a training field for the Norwegian Air Force after the Nazi occupation of Norway. The demands of World War II slowed residential development in this area. Wartime shortages kept many Americans at home and many Canadians were engaged in war activities. Postwar prosperity brought another boom based around the availability of the automobile, improved roads, and the newly affordable fiberglass boat. Suddenly owning a summer cottage became possible for the adventurous or the wealthy, and also for many in the middle class. They traveled by private automobiles, and the steamship companies were forced to retire their ships one by one, until the last sailing in the late 1950s.